Xiaomi has finally launched its new smartphones Redmi Y3 and Redmi 7 in india.The Redmi Y3 is the sucessor of Redmi Y2,which was launched in last year.Talking about the key features this smartphones.The Redmi Y3 comes with dot notch display,Snapdragin 632 Soc,Dual Camera setup and 32 MP Ai Selfie camera.The Redmi 7 comes with Snapdragon 632 Soc,Dual camera setup,Corning Gorillia Glass 5 and 4000mAh battery. The Redmi Y3 has a 6.2-inch HD + Dot notch display and it also has 2.5d curve glass with gorilla glass 5 protection.This smartphone is powered by a Snapdragon 632 Processor and this phone will runs on android 9.0 pie based on MIUI 10.The Redmi Y3 has come with two varient 3GB RAM and 32 GB internal storage and 4GB RAM and 64 GB internal storage.Storage can be expandable upto 256 GB via Micro-Sd card. Talking about the camera Redmi Y3 come with dual camera setup.The primary camera of 16 megapixel camera with f/2.2 aperture and secondary is 2 megapixel depth sensorMegapixel's primary sensor. It has a depth sensor of 2 megapixels. 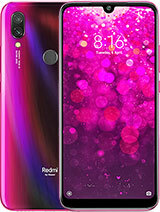 Rear camera setup is equipped with Phase Detection Autofocus (PDAF), Electronic Image Stabilization and Dual LED Flash Module.In front it has a 32 Megapixel camera for selfie.Talk about the camera feature Redmi Y3 it has a electronic image stabilization, auto HDR and AI portrait mode.This smartphone comes with a fingerprint scanner and Face Unlock for security. Redmi Y3 has a 4000 mAh battery.For connectivity this smartphone has a Dual 4G VoLTE, Wi-Fi 802.11 B / G / N, Bluetooth 5, GPS and GLONASS.The smartphone also has 3.5mm audio jack,Micro USB port,Ride Mode and FM radio.This smartphone has all important sensor like accelerometer, ambient light sensor, digital compass, gyroscope and proximity sensor. The Xiaomi Redmi 7 has a 6.2 inch HD+ Dot notch display,with aspect ratio 19:9 and this smartphone is powered by octa core Snapdragon 632 processor.This smartphone will runs on company's MIUI 10 based on android 9.0 pie.The Redmi 7 has come with three varient,First is 2GB RAM and 16 GB Inbuilt Storage,Second is 3GB RAM and 32Gb Inbuilt Storage and third is 4GB RAM and 64Gb Inbuilt Storage and storage can be expandable upto 256GB via Micro SD-card. Talking about the camera,the Redmi 7 has come with dual camera setup.The primary sensor is a 13-megapixel and secondary is 2-megapixel depth sensor.In front it has a 8-megapixel camera for selfie.Both the cameras has equipped with AI- features. The Redmi 7 has a 4000 mAh battery,For Connectivity it has a 4G VoLTE, Wi-Fi 802.11 A / B / G / N, Bluetooth 5.0, GPS / A-GPS, Micro-USB port and 3.5mm headphone jack.This smartphone has all important sensor like accelerometer, ambient light sensor, digital compass, gyroscope and proximity sensor. The price of Redmi Y3 in india for 3 GB RAM and 32 GB sto7rage variants is for Rs 9,999 and the 4 GB RAM and 64 GB storage is for Rs 11,999. The first cell phone of the smartphone will be held on April 30 at 12 noon. On this day, the handset can be bought from Amazon India, Mi.com and Mi home.The Price Redmi 7 for 2 GB RAM and 32GB storage variants is for Rs 7,999 and its 3 GB RAM and 32 GB storage variants is for Rs 8,999. The first sale of the Redmi 7 will be starts on April 29 at 12 noon and this phone is avaialble on Amazon India, Mi.com and Mi home store. Lenovo Z6 Pro With Snapdragon 855 Soc,Quad Camera Setup Launched,See Pricing & Specifications. Realme 3 Pro And Realme C2 With Dewdrop Notch Display,Dual Camera Setup Launched In India,See Pricong & Specifications. Moto Z4 Specifcations Leaked Online,Come With Snapdragon 675 Soc,48 MP Camera,See Details. Lenovo has launch its new flagship smartphone Lenovo Z6 Pro in china.This smartphone is a upgrade varient of Lenovo Z5 Pro,which was launched in last year.Talking about the key features,The Lenovo Z6 Pro comes with waterdrop notch display,Snapdragon 855 Soc,Quad camera setup,Next Generation In-display fingerprint scanner and 4000 mAh battery with 27W fast charging. The Lenovo Z6 Pro has come with a 6.3 inch FullHD + AMOLED waterdrop notch display. Its aspect ratio is 19.5: 9. This phone is powered by Qualcomm Snapdragon 855 processor.This phone is runs on android 9.0 pie based on ZUI .The Lenovo Z6 Pro comes with three varient First is 8 GB RAM + 128 GB storage,Second 8 GB RAM + 256 GB storage and third is 12 GB RAM + 512GB storage. Talking about the camera the Lenovo Z6 Pro has come with Quad camera setup.There will be a 48-megapixel primary sensor, second is 16-megapixel Ultra-Wide Sensor,third is 8-megapixel Telephoto lens and 2 Megapixel Camera time-of-flight (TOF) camera for depth. Apart from this, it is also equipped with dual OIS (optical image stabilization).Talking about the camera features this phone has Super Night Scene Mode, Super Macro, Super Wide-Angle Shots and Hyper Video,dual-tone LED flash and laser autofocus.In front it has a 32-megapixel selfie camera with F / 2.0 apertureThis phone also has a in-display fingerprint scanner and face-unlock features. 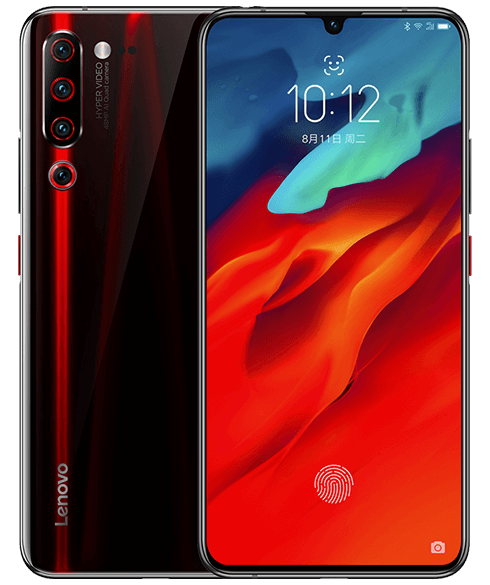 The Lenovo Z6 Pro Pro has a 4000 mAh battery with 27 watt fast charging support and USB Type-C port.For Connectivity it has a 3.5mm audio jack, 4G VoLTE, Bluetooth and Wi-Fi support.This smartphone has all important sensor like proximity sensor, ambient light sensor, digital compass, gravity sensor and gyroscope. The price of Lenovo Z6 Pro in china for 6 GB + 128GB variant is for 2,899 Chinese yuan (around 30,000 rupees). There are three more variants of this phone - 8 GB RAM + 128 GB storage is for 2,999 Chinese yuan (around Rs 31,000),8 GB RAM + 256 GB storage is for 3,799 Chinese yuan (around 39,000 rupees) and 12 GB RAM + 512 GB storage is for 999 Chinese yuan (around 51,000 rupees).The company also going to launch the 5G variants of the Lenovo Z6 Pro in the Chinese market.This smartphone will be available in Black and Blue colors.As of now there is no information about the launch of the Lenovo Z6 Pro in India. Xiaomi Redmi 7 Will Launch Along With Redmi Y3 On 24 April In India,See Details. Realme has finally launched its new smartphones Realme 3 Pro and Realme C2 in india in an launch event held in delhi.The Realme 3 Pro comes with powerfull processor and amazing cameras.Talking of the key features of this smartphones.The Realme 3 Pro comes with waterdrop notch display,Snapdragon 675 Soc,Dual Camera setup and 4045 mAh battery with Vooc charge 3.0.The Realme C2 comes with waterdrop notch display,Mediatek Helio P22 Processor,Dual camera setup and 4000 mah battery. The Realme 3 pro has a 6.3-inch Full HD + waterdrop notch display and it also has 2.5d curve glass with gorilla glass 5 protection.This smartphone is powered by a Snapdragon 710 Processor and this phone will runs on android 9.0 pie based on color Os 6.The Realme 3 pro has come with two varient 4GB RAM and 64 GB internal storage and 6GB RAM and 128 GB internal storage.Storage can be expandable upto 256 GB via Micro-Sd card. Talking about the camera Realme 3 pro come with dual camera setup.The primary camera of 16 megapixel camera with f/1.7 aperture and secondary is 5 megapixel with f/2.5 aperture.In front it has a 25 Megapixel camera for selfie.Talk about the camera feature Realme 3 Pro has 960-frame-per-second super slow motion video recording, Ultra HD mode and optimized nightscape mode to take pictures of 64 megapixels.This smartphone comes with a fingerprint scanner and Face Unlock for security. 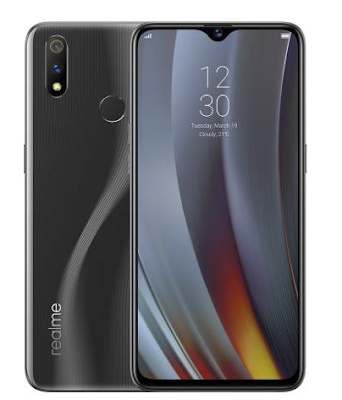 Realme 3 has a 4045 mAh battery with Vooc Charge 3.0.For connectivity this smartphone has a Dual 4G VoLTE, Wi-Fi 802.11 B / G / N, Bluetooth 5, GPS and GLONASS.The smartphone also has 3.5mm audio jack,Micro USB port,Ride Mode and FM radio.This smartphone has all important sensor like accelerometer, ambient light sensor, digital compass, gyroscope and proximity sensor. 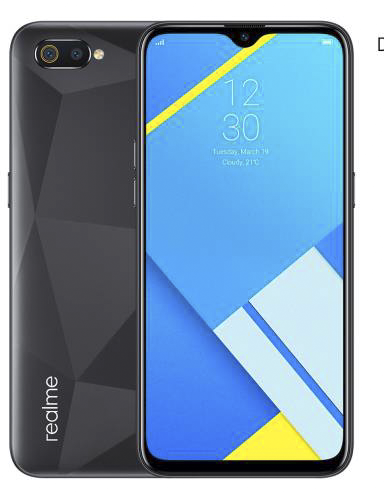 The Realme C2 has come with 6.2-inch HD + waterdrop notch display.This smartphone is powered by a Mediatek Helio P22 Processor and this phone will runs on android 9.0 pie based on color Os 6.The Realme C2 has come with two varient 2GB RAM and 16 GB internal storage and 3GB RAM and 32 GB internal storage.Storage can be expandable upto 256 GB via Micro-Sd card. Talking about the camera Realme C2 come with dual camera setup.The primary camera of 13 megapixel camera and secondary is 2 megapixel depth camera.In front it has a 5 Megapixel camera for selfie.The camera of Realme C2 equipped with AI features.This smartphone comes AI Face Unlock for security. Realme C2 has a 4000 mAh battery.For connectivity this smartphone has a Dual 4G VoLTE, Wi-Fi 802.11 B / G / N, Bluetooth 5, GPS and GLONASS.The smartphone also has 3.5mm audio jack,Micro USB port,Ride Mode and FM radio.This smartphone has all important sensor like accelerometer, ambient light sensor, digital compass, gyroscope and proximity sensor. The price of Realme 3 Pro For 4 GB RAM and 64 GB storage variants is for Rs 13,999 and the 6 GB RAM + 128 GB storage variant is for Rs 16,999.This smartphone is avaialble in Carbon Gray, Nitro Blue and Lightning Purple colors.The first of this smartphone starts on April 29 at 12 noon.This smartphones is available on flipkart and Realme's official website. Samsung Galaxy A40s And Galaxy A60 With Triple Camera Sertup Launched,SeeDetails. Motorola will soon launch its new smartphone Moto Z4 and Moto Z4 play.Earlier the specification of Moto Z4 play are leaked and now the specification of Moto Z4 are leaked online.Talking about the key specifications,The Moto Z4 comes with 6.4 in OLED Waterdrop notch display,Snapdragon 675 Processor,48 MP Camera and In-display fingerprint scanner. According to the leaked report.The Moto Z4 has come with 6.22 inch full-HD + (1080x2340 pixels) OLED waterdrop notch display and 19.5: 9 aspect ratios.This smartphone will be powered by Snapdragon 675 processor.This smartphone will run android 9.0 pie out of the box.The smartphone will have two varient first is 4GB RAM + 64GB storage and second is 6 GB RAM + 128GB Storage. Talking about the camera, it is reported that the Moto Z4 will have 48 megapixel sensor. In front it has a 24-megapixel camera is expected to be provided.It has also been claimed in the report that Motorola's handset will come with in-display fingerprint scanner. The Moto Z4 come with 3,600 mAh with 18w fast charging technology and have USB Type-C port and 3.5mm audio jack. As of now, the launch date and price has not been disclosed by the company. Vivo Y17 Specification Leaked Online,Expected To Launch Soon In India,See Details. Xiaomi has already confirmed that they launch its Xiaomi Redmi Y3 on 24 april in india.Now there is also information that conmpany will also launch the Redmi 7 along with Redmi Y3 in india on 24 april.Xiaomi India MD, Manu Kumar Jain has tweeted an image on April 18. Although this picture has highlighted sales of seven million units of Xiaomi Redmi Y series smartphone, but in the image there is focuses on '7', it indiacate that the company will launch redmi 7 along with Redmi y3 in india on 24 april.The Redmi 7 is already launched in china. The Xiaomi Redmi 7 has a 6.2 inch HD+ display,with aspect ratio 19:9 and this smartphone is powered by 1.8 octa core Snapdragon 632 processor.This smartphone will runs on company's MIUI 10 based on android 9.0 pie.The Redmi 7 has come with three varient,First is 2GB RAM and 16 GB Inbuilt Storage,Second is 3GB RAM and 32Gb Inbuilt Storage and third is 4GB RAM and 64Gb Inbuilt Storage and storage can be expandable upto 256GB via Micro SD-card. It expected that the price of Redmi 7 in india is between Rs 6,000-Rs 8,000.All other information can be provided by the company in an launch event held on 24 april. Honor 20i With 32 MP Selfie Camera Will Launch On 17 April,Specification Revealed,See Details. Samsung has launched its new smartphones Galaxy A40s and Galaxy A60 under its new Galaxy A series in china.Talking abou the key features of this smartphones.The galaxy A40s comes with infinity u display,triple camera setup and 5000mAh battery.The Galaxy A60 comes with infinity-o display,snapdragon 675 processor,32 MP selfie camera and 4500 mAh battery. The Samsung Galaxy A60 will have a 6.3 inch FullHD + Super Amoled Infinity O display. Its aspect ratio is 19.5: 9. This phone is powered by 2.0Ghz Octa-core Snapdragon 675 processor.This phone is runs on androi 9.0 pie based on samsung's One UI .The Galaxy A70 comes with 6 GB/8GB RAM + 128 GB/128GB storage.The storage can be expandable upto 512 GB via MicroSD card. Talking about the camera the Galaxy A60 has come with triple camera setup.There will be a 32-megapixel primary sensor with F/1.7 aperture,the second 8-megapixel fixed-focus Ultra-Wide Sensor with F/2.2 aperture and the third is 5-megapixel depth sensor with F/2.2 aperture .In front it has a 32-megapixel selfie camera with F / 2.0 aperture.It will also come with fingerprint scanner and face-unlock features. The Galaxy A60 has a 4,500 mAh battery with 25-watt fast charging support and USB Type-C port.For Connectivity it has a 3.5mm audio jack, 4G VoLTE, Bluetooth and Wi-Fi support.This smartphone has all important sensor like proximity sensor, ambient light sensor, digital compass, gravity sensor and gyroscope. The Samsung Galaxy A40s will have a 6.4 inch FullHD + Super Amoled Infinity U display. Its aspect ratio is 19.5: 9. This phone has been powered by Exynos 7904 Octa-core processor. It will come with 4 GB RAM + 64GB storage and 6 GB RAM + 128 GB storage and storage can be expandable upto 512 GB via MicroSD card. talking about the camera the Galaxy A40s has come with triple camera setup.There will be a 13-megapixel primary sensor,the second is 5-megapixel super wide sensor and the third 5-megapixe TOF Sensor. In front it has a 25-megapixel selfie camera.It will also come with fingerprint scanner and face-unlock features. The Galaxy A50 has a 5,000 mAh battery with 15-watt fast charging support and USB Type-C port.For Connectivity it has a 3.5mm audio jack, 4G VoLTE, Bluetooth and Wi-Fi support.This smartphone has all important sensor like proximity sensor, ambient light sensor, digital compass, gravity sensor and gyroscope. 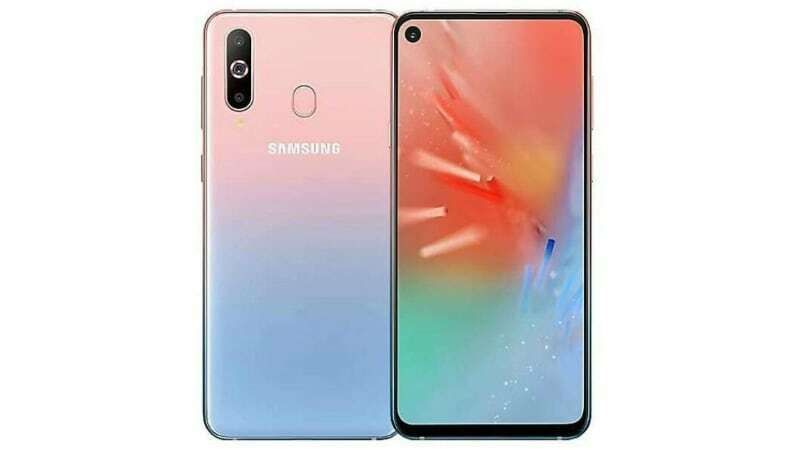 The price of Samsung Galaxy A60 for 6GB RAM and 128GB storage is for 1999 CYN( around Rs 20,700).The price Samsung Galaxy A40s for 6GB RAM / 128GB storage is for 1499 CYN (aroundRs 15,600).As of now there is no information about the launch of this phone indian market. Honor 20i With 32 Mp Selfie Camera,Kirin 710 Processor Launched,See Pricing and Specifications. Samsung Galaxy A70 With Triple Camera Setup,4500 mAh Battery Launched In India,See Details. Honor has finally launch its new smartphones Honor 20i under its new Honor 20 series in china.The honor 20i comes with gradient colour and triple camera setup.Talking about the key features,This smartphones comes with waterdrop notch display,Krin 710 Processor,Triple camera setup and 3400 mAh battery with 10w fast charging support. The Honor 20i has a 6.2 inch FullHD + waterdrop notch display. Its aspect ratio is 19.5: 9. This phone is powered by Snapdragon 710 processor.This phone is runs on androi 9.0 pie based on EMUI 9.0.The Honor 10i comes with two storage option.First is 4 GB RAM + 128 GB storage and second is 6 GB RAM + 128 GB storage.The storage can be expandable upto 512 GB via MicroSD card. Talking about the camera the Honor 10i has come with triple camera setup.There will be a 24-megapixel primary sensor with F/1.8 aperture,the second is 8-megapixel wide angle Sensor and the third is 2-megapixel depth sensor.In front it has a 32-megapixel selfie camera with F / 2.0 aperture.The cameras of honor 10i equipped with Ai features.It will also come with fingerprint scanner and face-unlock features. The Honor 10i has a 3,400 mAh battery with 10-watt fast charging support.For Connectivity it has a 3.5mm audio jack,Micro USB Port, 4G VoLTE, Bluetooth and Wi-Fi support. 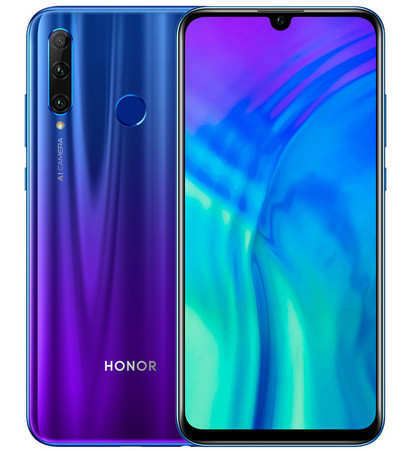 The Price of Honor 20i for 4 GB + 128GB variant is for 1,599 Chinese yuan (around 16,600 rupees). Its 6 GB + 64GB model is for 1,599 Chinese yuan (about 16,600 rupees) and its 6 GB +128 GB variant is 1,899 Chinese yuan (about 19,700 rupees). As of now there is no information about the launch of this phone in india.This smartphones is available in three color variants - Gradient Blue, Gradient Red and Magic Night Black.